You might be asking yourself why anyone needs to do this! 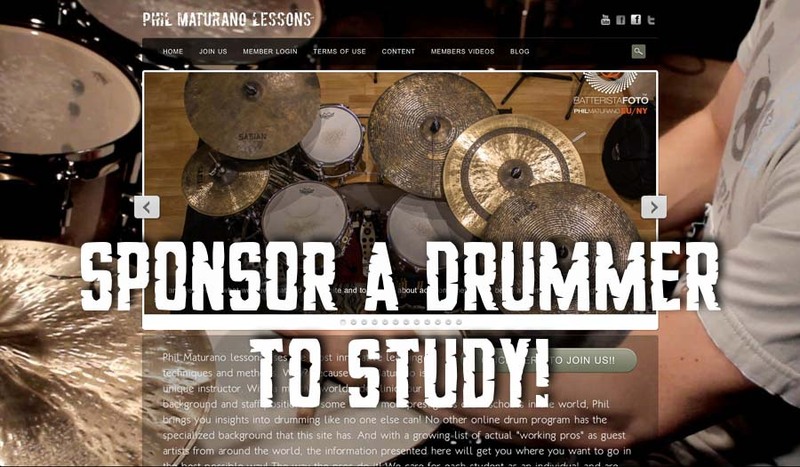 I have created this system because I hear from many drum students around the world, who want to study seriously but haven’t got the funds to do it. Many of my students are from Asia, South America and places where the currency is far below the US dollar or life is hard in general. It’s not easy being a student in this world. Even harder I think, to be a music student. So, for my friends who would like to contribute to the lives of future musicians, you can now SPONSOR a drummer. 1) Make a contribution for a drummer you know to sign up on my lessons site. As soon as the initial funds are raised for whatever membership you would like him or her to have (Monthly, Quarterly, Yearly) I will notify them and they can begin their studies with me, on my site right away! 2) Make a general contribution to the site and when there is enough funds to sign up a student I will pick a drummer in a region of the world that has difficulty meeting costs. I know many that would love to study with me but cannot. When I select someone I will feature you along with him or her on my pages (Facebook, Twitter, Instagram etc) so all those that contributed can follow the progress we are making. You could also be in touch directly with the student. Even myself…when I was a kid in South America…My chances of studying were NON. There were no pro drummers in that area of the world at the time and I know the pain of not having funds for a proper teacher personally! Of course I will be flexible with the fees so if we do not reach targets I will be accepting students anyway. In fact we already do at no cost to the student if he is truly deserving. But I think this is a great way to help people and make things possible for everyone. Use the bottom below to contribute. You can contribute any amount you wish. I really appreciate everyone that takes part in this! Once you make your choice of plans please email me and I will set up your account. You will be featured on all my social media pages and receive a special thank you from the students.